Start at Goodge Street station on the Northern Line. Fitzroy Street runs parallel to Tottenham Court Road to the left going north. 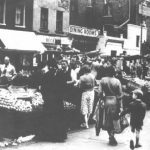 This was home to a group of painters called the Camden Town Group ‘founded over a Soho dinner table by sixteen revolutionary young painters’. Amongst its members was Augustus John, Harold Gilman, Spencer Gore and Walter Sickert. Walter Sickert was accused of being Jack the Ripper (although this accusation had been made before by others) by Patricia Cornwell but see The Camden Town Murder for refutation of this. Sickert often used the Bedford Music Hall as inspiration. As you walk north you come into Fitzroy Square which was the home of George Bernard Shaw. There is a plaque at number 29. GBS sat on St Pancras Council and was a member of the now defunct London County Council. Turn right into Euston Road. The area on the left past the station, between it and St Pancras Station – itself a monument to neo-Gothic architecture – is called Somers Town and was one of the worst slums in London. It was the setting for many of Dickens novels and many of the Ealing Comedies of the 1950’s were shot on location here. Turn left along Pancras Road, past Kings Cross Station, underneath the grim railway arches in the shadow of the derelict gasometers and you find St Pancras Church. This contains one of the first altars to be established in Christian Britain and named after one of its earliest Saints – St Pancras, who has given his name to the area. Somewhere in the graveyard is the tomb of the last man out of the Black Hole of Calcutta – a less savoury episode in British history. Follow the road round and on the left is Goldington Buildings, a landmark housing development and home to Ethel le Neve. She was the mistress of Dr H H Crippen who was hanged for the murder of his wife. Crippen achieved notoriety for being the first person apprehended as a result of radio. His house is in Hilldrop Crescent, close to Holloway Women’s prison in Camden Road. Shortly after his execution the houses were re-numbered so no-one is now sure exactly where he lived. 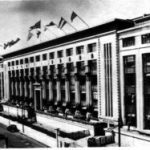 If you stand at Mornington Crescent tube station you can see the huge white building that was the Carrera’s factory built in 1928. It offered work for hundreds of Camden women and was always known as the Black Cat factory after the cigarettes that were produced there. Halfway along Camden High Street is a small passage above which is Bedford House. This is all that remains of the Old Bedford Music Hall. 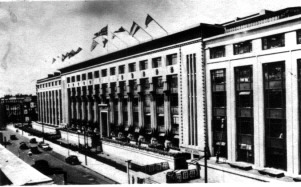 All the greats performed here – Gracie Fields, Charlie Chaplin, Marie Lloyd and George Robey. 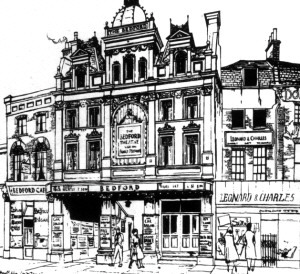 It escaped terminal damage in the war but after an attempt to rescue it, it fell into disrepair and was finally demolished in 1969 (for a fuller account of this place see my page on The Old Bedford Music Hall. Turn left at the lights and you come into Delancey Street which winds round to Parkway from where you can see Cecil Sharp House, home of the English Folk Singing and Dance society. The main line to Kings Cross runs underneath here and at the end lived Dylan Thomas from 1934 to 1938. He hated Camden and Delancey Street. He lived in a basement flat and most of the time worked in a caravan that was parked at the end of the garden. The last time I enquired it was still there at 54 Delancey Street. Turn right down Parkway and on your left is Arlington Road, where is situated Arlington House; always known as the local doss house. 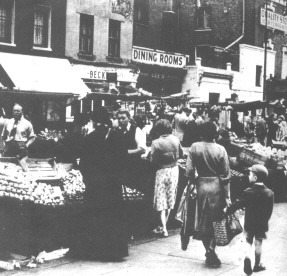 Left along Camden High Street and you find Inverness Street which is home to a daily market – mostly fruit and veg but also The Good Mixer. Local legend has it that when the pub was commissioned it was to be called something ordinary like the Kings Arms but when the workmen came to complete the cellar they used a concrete mixer. When the work was finished they couldn’t get the mixer out of the cellar and it was left there. Still there today for all I know – at the Good Mixer. Double back to Camden Road and walk north. On the right past the railway bridge is Murray Street where you will find the Irish Centre – built in 1955 for the rescue of the many Irish builders that flooded into Camden looking for work. St Pancras ends at the boundary of Camden Road and Brecknock Road. Lt Col. Munro killed his brother-in-law close to the site of the Brecknock Tavern in the last fatal duel in England. He fled the country and was afterwards imprisoned. A suitable place to end. This is a long, arduous walk which follows the track of the Northern Line. Ease the journey by using tube or buses by buying one of the many offers that are available on London Transport and then you can hop on or off buses and trains at will. 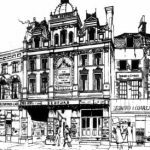 The b/w illustrations on this page come from a publication called ‘The end of one story – A Souvenir of the Borough of St Pancras’ published in 1965 when the old borough became part of Camden. There is an acknowledgments page but it is not clear to which photo each credit refers. This page and more in a similar vein comes from a collection in my eBook. An echo from the Green Fields. A selection of pages featured in the book can be read by following the links in the right hand sidebar; all pages are on this site.